Biden Talks Education; Miami Audience Listens For Clues To Presidential Bid NPR: Vice President Joe Biden is mulling a run for the White House. He made an education speech in Miami on Wednesday, but made no mention of politics or his deliberations. See also NYT. More Students Are Taking The SAT, Even As Scores Fail To Improve HuffPost: The data reveals that a record number of students from the class of 2015 took SAT and AP exams, and these students were more diverse than in years past. See also Washington Post, LA Times. The new face of Democrats who support education reform: LA Times: Shavar Jeffries, an attorney who lost his bid to be mayor of Newark, N.J., is the new president of Democrats for Education Reform.Jeffries is taking the place of Joe Williams, a former New York Daily News reporter who led DFER until recently. Williams is now working at the Walton Foundation, a major education philanthropy organization that is known for sponsoring the growth of specific charter school chains, sources say. Dyett Hunger Strikers Share Concerns with Arne Duncan in D.C. Sun Times: Duncan dropped in the meeting, joined by senior adviser Ruthanne Buck and Khalilah Harris, the deputy director at the White House Initiative on Educational Excellence for African Americans, which is housed in the Education Department. Testing Opt-Outs Cost Disqualify New York Schools From Blue Ribbon EdWeek: State officials inform 11 schools that they don’t qualify for the national Blue Ribbon program because their test-participation rates fell short of the required 95 percent. See also Minneapolis Star Tribune. With Ceramics, Debate, Choir and Band, Urban Schools Revive Electives Washington Post: This year, neighborhood high schools are each expected to offer at least 20 electives and six advanced placement courses. Equal access to educational opportunities, including Advanced Placement courses and extra-curricular activities, is also a national concern. Newark Teachers Get Money to Buy School Supplies WSJ: In a back-to-school gift, Superintendent Chris Cerf said Wednesday that every district teacher will get $100 to buy their own classroom supplies this fall and each principal will get $7,500 to bolster instruction. A $700,000 grant from the $100 million pledged by Facebook Inc. founder Mark Zuckerberg in 2010 will pay for the initiative. Why Are Colleges Really Going Test-Optional? 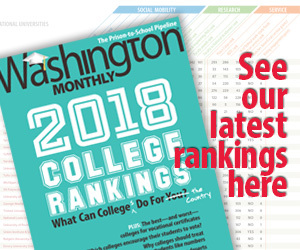 NPR: George Washington University recently announced it would no longer require applicants to submit SAT scores, hoping to improve campus diversity. But does going test-optional actually do that?